Content marketing is a growing sector, but are increased budgets leading to better outcomes? This blog summarizes some recent research from the Content Marketing Institute. There’s a famous four-box diagram called the Growth-Share Matrix, from the equally renowned Boston Consulting Group. It’s designed to help you work out which of your products to cull, improve, or invest in — by plotting the rate of growth in a market against your share of that market, divided into quadrants labelled dead dogs, problem children, cash cows, and rising stars. 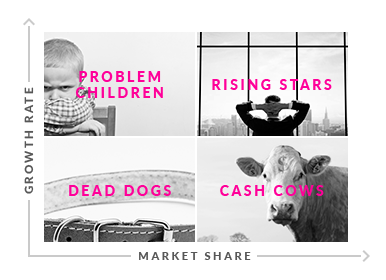 The two places you want to be are among the cash cows and rising stars. Cash cows are products and services firmly established in the market, producing a nice revenue stream without needing much investment. Rising stars, by contrast, are where the action is: high-growth marketspaces with market share there for the taking. Content marketing, if you hadn’t guessed already, is a rising star market. Growing fast, with lots of opportunities. But taking advantage of a rising star carries a cost burden: there’s a lot of investing to do. Because of the way results lag investment, content marketers sometimes have a problem calculating the ROI of the content. (Call it ROC: Return on Content.) But help is at hand, because the CMI (Content Marketing Institute) has just completed its annual B2B Content Marketing Report... and it’s packed with stats that shed light on this issue. This blog summarizes some of its findings to help you win greater ROI from your content marketing strategy. Think of your content marketing in its proper context — existing alongside all the content from your competitors, every blog and eGuide fighting hard for a share of the prospect’s mind. That’s the market you’re in — a market for information. Where the best “vendors” (creators of content) win the largest share of the audience’s mind … and go on to build sustained relationships with them. This is why it makes sense to treat your content marketing like a rising star — something that pays back big-time, but which takes extra investment in the short term. From the B2B Content Marketing Report 2018, it’s obvious the most successful content marketers are taking this route. 55% of successful content marketers expect to increase their budget in 2019. Just a few years ago, the majority of any budget for online marketing went on media — banner ads, popups, interstitials, wraparounds, all the advertising media that ride into your mind on the back of someone else’s content. This was a natural first step, copying a pre-existing medium (broadcast TV) just as the first TV shows featured actors clustered around a microphone as if they were still making radio plays. While all those advertising choices are still around, marketing spend today focusses far more on content creation. With the content destined for earned or owned media rather than paid. And when you think about it, that’s great news. Because it means your hard-earned cash is going into the quality of your marketing communications, not the pockets of a media owner. Potentially giving you a much stronger point of differentiation. There are plenty of large businesses with big budgets … whose “content” is so thin or dull it passes readers by. 56% of content marketers reported their greatest budget increase was in content creation. A review of the dataset suggests that even as total content marketing spend is increasing, an ever-greater proportion of that spend is going into quality creative work, rather than buying advertising space on websites. Because in a world where most content is discovered via SEO, you can’t bore someone into consuming your content; you have to interest them in it. Allocating more resources to content creation gives you a bigger footprint in search, greater pass-around as people share useful links across social media, and — of course — a longer linger in the customer’s mind. Long enough, with luck, to get them to the next stage of the customer journey towards you. Equally important in maximizing your ROC is to have a personality of your own. Dry technical content won’t excite most prospects, however information-rich. And looking like everyone else’s content won’t differentiate you. (Worse, it may make prospects think you’re another company.) So make an effort to develop a distinctive voice. Of all marketing tasks, a consistent voice is among the hardest. The wry humour of The Economist, the hipster cool of Apple, the understated superiority of Audi — all these tones of voice took years of nurturing. But once established, it makes your content far more effective than your competitors, because prospects recognize you a lot faster. 70% of content marketers described their efforts this year as more successful than last year. Just as the biggest brands on TV spend millions differentiating their personality from their competitors, content marketing is breathing creativity and life into its output. One thing that can help a lot is a documented content marketing strategy that all stakeholders within your organization buy into. (And that includes the C-Suite.) Once you’ve got your approach written down, you’ll see your disparate chunks of content start looking like a coherent whole. And let your content marketing partner challenge you! It’s hard being a content marketing agency’s client. You carry the weight of your brand on your shoulders: you want everything you create to spread sunshine about your product while offending no-one. Trouble is, that’s not the way to create content that gets read. 94% of successful content marketers value creativity and craft in content production. So if you partner with a content agency, ask them for ideas that make you sweat a little and keep you awake at night. Maybe it’s a bit controversial, maybe it unites your customers behind a shared belief. Look for graphics treatments with a little more verve, colours a little more vivid. Ask for articles that you’d read on your Kindle at bedtime, not trudge through as part of your job. No great advertising campaign ever happened without taking a few calculated risks. And no content marketing campaign should, either. And that means compelling concepts, great graphics, terrific writers. The best content marketers, it seems — like the 1,947 surveyed by the CMI — already know this. It’s less about the media buy, more about improving your creative work to better answer the customer’s information needs. Above all, this is a “market” with a long way to go — a rising star sector, where the winners haven’t been decided yet. Spending patterns are changing, but the human element is just as important. Take a look at why investment in humans and machines will be crucial for the future of marketing. Download our Future of Marketing eGuide to find out more.